In the composite chart, composite Mars can show where you’re driven together and in the relationship. Mars is the planet of energy and drive, so his location can bring a lot of energy that can be good or bad. With Composite Mars in the 1st house, you can have more energy and drive together than you do apart. You can both focus a lot on the relationship and each other, but you may have too much energy at times, and you can have a lot of arguments with each of you wanting to have things your own way. Learning to compromise can be very important with this placement so you’re not trying to be overpowering with one another. With Composite Mars in the 2nd house, you can take your time with one another, and you may not feel the need to rush with each other. Once you do something together, you can stick with it and have more staying power. This is the house of money, so this placement is good for a business relationship built around making money. You can earn more money together than apart, but you can also spend more money and use up more resources, so you need to exercise moderation. With Composite Mars in the 3rd house, mental expression is important for this relationship. You each want to express your thoughts, opinions, ideas, and talk things over with one another, but you may get into arguments over what you say and think more. You need to make sure you’re allowing one another to express yourselves and not try to force your ideas and opinions on one another. Freedom of expression is required. 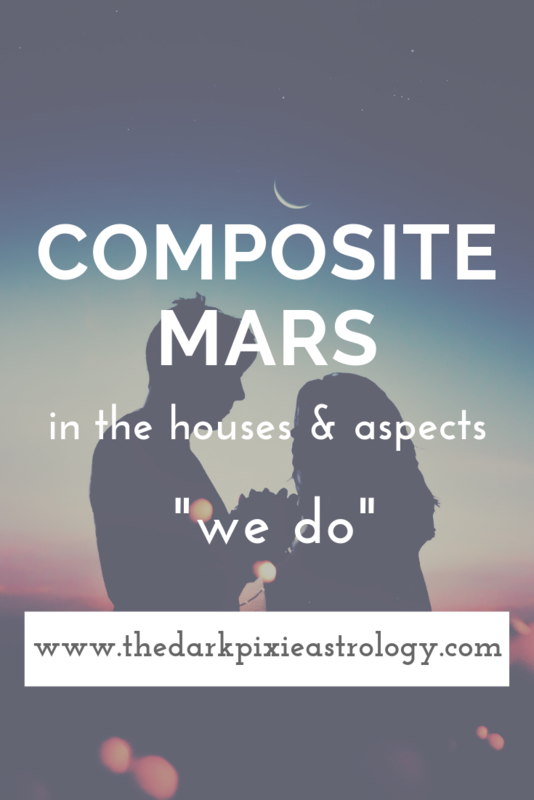 With Composite Mars in the 4th house, emotional expression is important for this relationship. You each want to express your emotions, what you feel about situations, and how you feel within the relationship. This can cause more arguments when you don’t understand one another emotionally, or when you’re being too subjective. This can be a good placement for a family relationship, though there may be more arguing. With Composite Mars in the 5th house, creative expression and joy is important for this relationship. You can come together to have more fun than with others, but you can focus too much on your own ego needs and drives that you’re not as considerate of one another as you need to be, especially in a personal relationship. You need to help one another fulfill both of your needs. This can be a great placement for a friendship. With Composite Mars in the 6th house, you can be driven to focus on daily life and routine together, so in a personal relationship, you can be more practical with one another. This may be a better placement for a business relationship, though you may have one person putting in more work than the other with can cause arguments. If you can both focus on your work together, you can get a lot done. With Composite Mars in the 7th house, the relationship can be more important to you and you can put a lot of energy into the relationship. You can be more willing to make compromises with one another, and work to meet in the middle, but if you don’t feel the other is being fair, that can cause a rift. In general, this can be a good placement for any serious relationship/partnership since this is the house of committed relationships. With Composite Mars in the 8th house, there can be more struggling over power and control between you. You may try to dominate one another, and have to work on treating each other with more respect. This relationship can serve to help you each transform, grow, and gain more understanding of yourselves, but it can be intense and all-consuming at times, which can be difficult to handle and feel overwhelming. With Composite Mars in the 9th house, you can feel driven to expand your lives and have new experiences together, and this can be a good placement for travelling or learning together. You can debate over beliefs and outlooks, and you try to keep things light, but you may fight over your beliefs at times, so you have to remain open. If you have the same beliefs, this can be a strong link between you. With Composite Mars in the 10th house, you can be driven to achieve status and success together. This can be an excellent placement for a professional relationship because of this, and you can achieve more together than apart. In a personal relationship, you may focus more on how you’re perceived by others and the way you look together, and need to work on having just as much energy for a real connection. With Composite Mars in the 11th house, you can come together with common ideals and views of the world, and this helps you get along well. If you don’t see things the same way, you can have a harder time getting along, but can still be more open. This can be a great placement for a friendship, as well as for a partnership focused on charitable ventures and making an impact on the world on a large scale. With Composite Mars in the 12th house, subconscious motivations can be more of an issue in this relationship, and you can have to work on trying to resolve those internal issues you each have before you can have a good pairing. You may feel less driven and focused together on external matters, and instead focus more on intangibles. You may feel that there is a spiritual connection between you that’s difficult to explain. With Composite Sun conjunct Composite Mars, this can bring a lot of energy and drive into the relationship. You may want to express yourselves fully, but this can lead to arguments and conflict if you’re not careful with how you do that. There can be a lot of passion in this relationship that needs an outlet. With Composite Sun sextile or trine Composite Mars, you can spend time together doing things that you mutually enjoy, and you can accomplish a great deal, so this aspect can be beneficial for a professional relationship. With Composite Sun square or opposite Composite Mars, there can be a tremendous amount of energy between you, and it can be difficult to grasp and control. You can get into a lot of fights, and need to work on allowing one another to express yourselves and find a constructive outlet for the energy. With Composite Moon conjunct Composite Mars, the feelings you have for one another and within the relationship may be much stronger than you’re used to. There can be a tremendous amount of emotional energy that drives the two of you together, but it can also drive a wedge between you and push you apart if you don’t work together. With Composite Moon sextile or trine Composite Mars, it can be easier for the two of you to go in the same direction, to want compatible things, and to have more emotional energy, but use it in a positive way. With Composite Moon square or opposite Composite Mars, there can be an overabundance of emotional energy, and this can lead to constant arguments and conflict in the relationship. You may each be too subjective, and need to have greater emotional understanding. With Composite Mercury conjunct Composite Mars, there can be an abundance of mental energy in this relationship, and words fly between. It can be positive in that you each express yourselves openly, but it can be negative in that you can argue a lot since you each feel strongly about your ideas, opinions, and positions with one another, so an open mind is required. With Composite Mercury sextile or trine Composite Mars, the flow of expression between you can be healthy, and you can share whatever you want with one another. With Composite Mercury square or opposite Composite Mars, it can be difficult for you to see eye-to-eye, and you can get into a lot of fights because of that. You each stick to your ideas and opinions strongly, and don’t want to budge for the other. Remember that compromise and agreeing to disagree isn’t a bad thing. With Composite Venus conjunct Composite Mars, the passions in this relationship can be strong. In a sexual relationship, this can lead to a strong attraction between you. In a platonic relationship, you can find that you have a lot of energy between you that needs to be channelled into something, otherwise you can get into a lot of fights. With Composite Venus sextile or trine Composite Mars, there’s a more pleasing attraction between the two of you in a romantic relationship, and any relationship can have more harmony and balance. With Composite Venus square or opposite Composite Mars, the sexual chemistry can be very high in a romantic relationship, and there’s a lot of energy involved no matter what type of relationship this is, but this can lead to some instability. Ground yourselves and the relationship. With Composite Mars conjunct Composite Jupiter, there can be an abundance of energy between you and in the relationship. You can feel more driven together and more energized to do things. In a personal relationship, you can push one another and get further together. In a professional relationship, you can work well together and find opportunities for success that you wouldn’t find alone. With Composite Mars sextile or trine Composite Jupiter, you can help one another to achieve your goals and have the experiences that you want to have in life. With Composite Mars square or opposite Composite Jupiter, you can still have good energy between you for what you want, but you need to make sure you’re on the same page, going in the same direction, and focused on a common goal.